BOISE – Former state Sen. Mark Ricks, of Rexburg, was named lieutenant governor Thursday in an apparent nod to the state’s more agrarian eastern half. Ricks, 81, a farmer who left office after eight terms in 1994, is a Church of Jesus Christ of Latter-day Saints member and was president of the Idaho Falls LDS Temple. He’s the great-grandson of Thomas Ricks, founder of Mormon-owned Brigham Young University-Idaho, which until five years ago was known as Ricks College. In naming Ricks, Gov. Jim Risch said the former lawmaker could help guide the Senate, where Ricks served as majority leader for six years, in case of a special legislative session on property tax relief later this summer. Risch made the announcement in Idaho Falls, where the three-day state Republican convention began Thursday. The governor favors raising the sales tax in order to eliminate the portion of property taxes that now pay for public school maintenance, though lawmakers in the 2006 session rejected that plan. Eastern Idaho’s political power has waned in recent years with population growth in Idaho’s more urban west, as exhibited by the Senate’s 21-14 rejection earlier this year of a plan to use Snake River water to recharge the depleted Eastern Snake Plain Aquifer. Many farmers favored the plan, but it was killed by lawmakers from the west and north who feared it could lead to higher Idaho Power Co. electricity costs. Ricks’ appointment by Risch, a lawyer from Boise who has represented the utility, can be seen as a symbolic olive branch, letting the region’s residents know their interests are important, said David Adler, an Idaho State University political science professor in Pocatello. Ricks was elected to the Eastern Idaho Agriculture Hall of Fame in 1989. The appointment also reaches out to social conservatives, in a year when there’s a constitutional amendment to ban gay marriage on Idaho’s November ballot. Ricks has championed family values and last year criticized U.S. Rep. Butch Otter, R-Idaho, for his unmarried lifestyle at a time when Risch was said to be considering a primary run against Otter for the governor’s job. Otter, who was divorced in 1992, has since announced he’ll marry his longtime girlfriend, Lori Easley, in August. 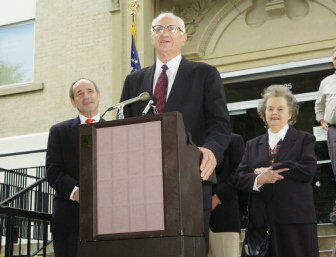 Risch left his post as lieutenant governor to step in for former Gov. Dirk Kempthorne, who was appointed U.S. interior secretary. Risch didn’t run against Otter in the primary, and aims for re-election in November as lieutenant governor against Democratic challenger Larry LaRocco. But some say Ricks’ appointment may mean Risch is courting conservative voters from eastern Idaho who could help him – should he decide on a gubernatorial run in the future. Otter is running against Democrat Jerry Brady. Thirty years ago, Ricks organized the local response following the Teton Dam disaster on June 5, 1976, which sent an 80-billion-gallon wall of water down the valley, killed 11 people and 18,000 head of cattle and all but destroyed Sugar City, which had to be largely rebuilt.